–> However, neighbours on the housing estate where the gunmen lived described the suspect as a typical young man who dressed in jogging pants and trainers rather than traditional Islamic robes. The Strasbourg Christmas market gunman was last night killed by police – two days after he killed three people and injured 12 in the latest terror attack to rock Europe. Cherif Chekatt opened fire on anti-terror police who tried to stop him outside a warehouse – but was shot dead in the street. Police found jihadist propaganda in his flat and have arrested his parents, two brothers and a fifth person in connection with the attack. The French interior minister also later confirmed the death of suspected gunman in a shoot-out with police. Christophe Castaner said three police officers stumbled across a man they believed to be Chekatt in the street and went to arrest him. As the officers approached him Chekatt turned to fire at them but they shot and killed him. 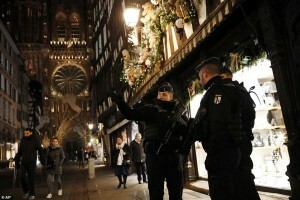 The gunman had been on the run since he killed three people in Strasbourg’s popular Christmas market two days ago and was shot dead by police this evening. Police officer Emmanuel Georg told BFM TV station that three police officers patrolling the neighbourhood tried to intercept a suspect corresponding to Chekatt’s description as he was about to enter a building. An eye witness to the shoot-out said he heard shots and rushed to the window to see what was happening and closed the shutters when he spotted the cornered suspect across the street. After it was over, he said he saw the man motionless on his back on the pavement, his left arm askew. 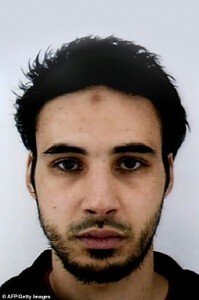 More than 720 French security forces had been hunting for the 29-year-old since the bloodshed on Tuesday night. A police source said he was shot and killed by police in the Plaine des Bouchers area, near the Neudorf area of the city. The police operation was launched around 8.30pm around just over a mile (nearly 2kms) from where he launched his deadly attack on festive shoppers. Several sources also claim that during the shooting no members of the police were injured during the operation. The Islamic State group’s self-styled news agency said that Chekatt was ‘an Islamic State soldier’ who ‘carried out the operation in response to calls for targeting citizens of coalition countries’ fighting the terrorist group’s militants in Syria and Iraq. Today the death toll from Tuesday’s attack rose to three as police combed the city in the east of France for a second day and manned checkpoints on the German border. Authorities say the 29-year-old was known to have developed radical religious views while in prison. Neighbours on the housing estate where Chekatt family’s lived described the suspect as a typical young man who dressed in jogging pants and trainers rather than traditional Islamic robes. The Paris prosecutor’s office said Chekatt’s parents and two brothers were being held in custody, while two of his sisters in Paris were also questioned today and one of their homes was being searched. French President Emmanuel Macron expressed ‘the solidarity of the whole country’ towards the victims as he arrived for a European summit in Brussels this evening. ‘It is not only France that has been hit… but a great European city as well,’ he added, referring to the seat of the European parliament in the eastern French city that lies on the border with Germany. Earlier today elite RAID police officers were scouring the French-German border for a car belonging to the mother of Chekatt amid fears he has fled eastwards in her vehicle. Officers were searching across three locations in the late afternoon, including the area where Chekatt was last seen. He had a history of arrests in Germany and police searches were spread across the border. The German newspaper Bild reported that police were on guard across the German border for a French numberplate on a Ford belonging to Chekatt’s mother, in which he could have fled the country. Swiss police are also said to have increased their security amid fears he was fleeing across Europe. Heavily armed police swooped on the Neudorf neighbourhood of Strasbourg on Thursday amid a massive manhunt for Christmas market shooter, Chekatt. Police cars blocked a street as officers carrying rifles and dressed in body armour gathered in the neighbourhood where Chekatt was dropped off by a taxi driver following his bloody rampage on Tuesday. As officers searched for the killer it emerged that they had found jihadist literature at his apartment, as well as a grenade, a loaded rifle and four knives. On Thursday Le Parisien also revealed that, during a prison stay in 2008, Chekatt hung a picture of 9/11 mastermind Osama bin Laden on his wall. Chekatt killed three people and wounded 12 during an attack on the city’s Christmas Market before fleeing when he was shot through the shoulder. One French police official said security forces, including the elite Raid squad, were taking action on Thursday based on a ‘supposition only’ that Chekatt, a serial criminal, could be hiding in a nearby building. This evening police ended their search in Neudorf without finding the killer, but as darkness fell officers continued to scour the nearby Meinau neighbourhood and the Plaine des Bouchers area. Police also arrested a member of Chekatt’s ‘entourage’ today, believed to be a friend who had served time with him in prison, after the killer’s parents and two brothers were earlier taken into custody. In the search this afternoon raid officers fanned out along one street, some with their guns trained on the houses in front of them, as television cameras watched on, while other officers extended a security perimeter in the neighbourhood. Children at a nearby school were placed in lock down while the operation took place, with parents told not to come and pick them up. 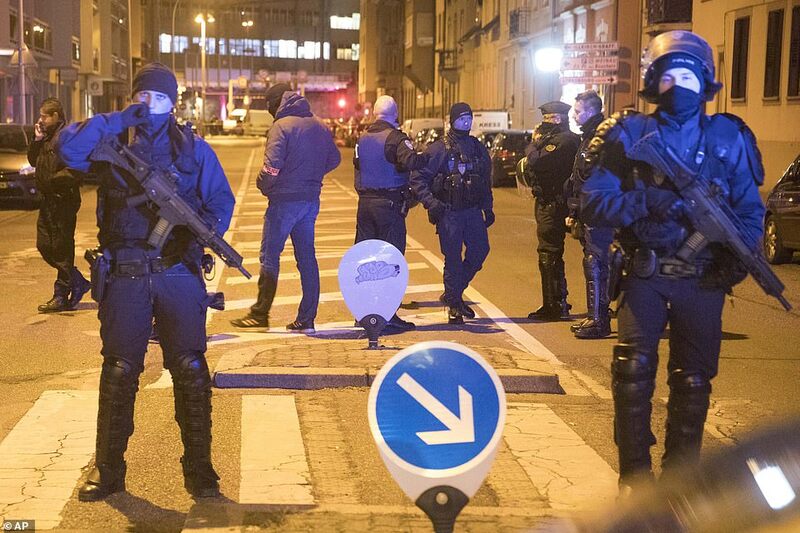 Police found writings calling for jihad at the attacker’s home, as well as a grenade, a rifle and four knives, of which two were hunting knives, regional newspaper DNA reported. Five people have been detained, believed to be Chekatt’s parents, two of his brothers and another person taken into custody on Thursday. The fifth person is reported to be a 39-year-old friend of the killer who once shared a prison with him. Chekatt is said to have stayed with the friend in Lingolsheim on the night before the attack. Police also raided the home of Chekatt’s sister in Paris, although they did not arrest her, according to Le Point. Officers apparently became suspicious over the sister’s links to a doctor who may have helped treat Chekatt after he was shot in the arm. Some 720 police and gendarmes have been scouring a huge section of eastern France using helicopter sweeps, roadside checks, border surveillance and house searches, but thus far have uncovered no trace of Chekatt. Another 500 troops have been sent to guard public places including Christmas markets amid fears Chekatt will attack again, with 1,300 more due to join soon. A government spokesman confirmed authorities have been told to capture Chekatt ‘dead or alive’, and that the most important thing is that he is found quickly. Officers have warned that Chekatt, who has been convicted 27 times starting when he was just 13, should be considered dangerous and not to approach him. Chekatt was put under observation by anti-terror police and was still being watched at the time he committed his attack, but didn’t show ‘any obvious signs’. Meanwhile Interior minister Christophe Castaner was dispatched to Strasbourg to handle the crisis while Emmanuel Macron is in Brussels at an EU summit. The attack came just as President Emmanuel Macron sought to take back control of the nation after a month of anti-government protests that have spread violence across the country. The Daily Mail report continues beneath the subheading: “Jewish graves found desecrated hours before Islamist rampage”. According to the Mail graves in a Jewish cemetery 12 miles from Strasbourg were daubed with Nazi swastikas. Given that the graves were found vandalised only hours before the Strasbourg shooting it’s worth asking if the two events weren’t linked? The Strasbourg gunman is obviously not some “white supremacist” but the fact that the graveyard was found vandalised shortly before he went on his alleged rampage suggests that the two events maybe linked. Or so we are being led to believe. Indeed it’s worth asking if the graveyard vandals didn’t know there was going to be terror attack nearby? Meaning that IF the vandals had prior knowledge of the shooting it was in fact a staged event. We reserve judgement but there are too many inconsistencies in the Strasbourg shooting for the official version of events to be accepted at face value. Ed.